Vintage From Paul is pleased to offer this Libbey Corporate sales Meeting Plate celebrating the Millennium. The plate was manufactured for the Libbey sales Meeting by the Syracuse China Company. Not only does the plate celebrate the new Millennium, but the central logo makes use of the multicolored Olympic Rings. 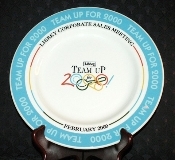 The Libbey Syracuse China Team Up For 2000 Corporate Sales Plate was used as a sales incentive for the top Sales Representatives at the Libbey annual Corporate Sales Meeting for the year 2000. The Libbey Syracuse China Team Up For 2000 Corporate Sales Plate has the signature Syracuse China white restaurant ware body. The rim is done in a bright turquoise which has in lighter blue lettering "Team Up For 2000". The inner verge is done in connecting red, yellow, green and blue bars which frame "Libbey Corporate Sales Meeting, February 2000". The central portion of the plate has a variation of the Olympic Rings and "Libbey Team Up For 2000". The Libbey Syracuse China Team Up For 2000 Corporate Sales Plate measures 10-3/4 inches in diameter and is without defect. The graphics are crisp, the colors vibrant. The plate is marked in black with "Made in the USA, A Product of Syracuse China Company,26-B-4, Since 1871"